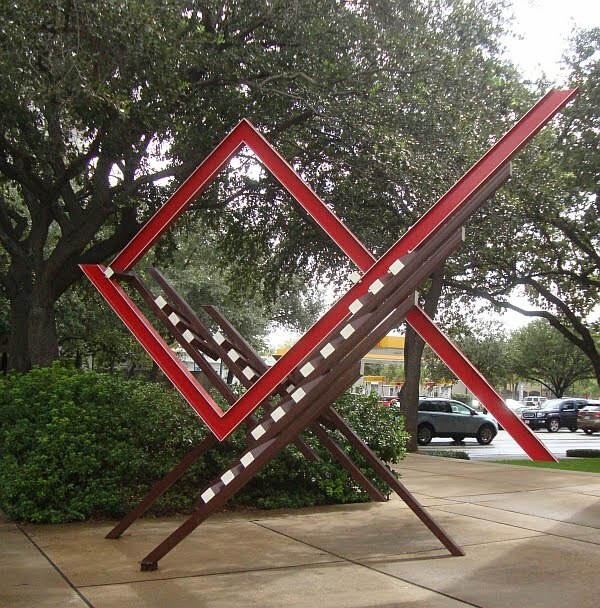 You've probably seen some of these sculptures if you have ever driven down Montrose past Richmond in Houston. I was in the Freed-Montrose Library the other day and decided to take some photos. One thing I like about this sculpture is that it isn't in a special place. They just plunked it down right beside the front door. This is an office building that comprises part of The Campanile, a group of office/retail properties owned by Hansen Partners. This group of properties includes the Black Lab, but I'm not sure if it includes the library itself. I wonder if office workers ever use this sculpture as an ashtray... 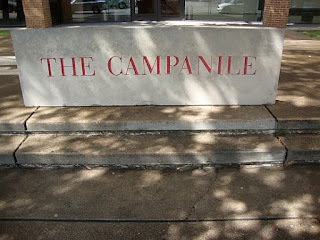 Anyway, this building houses Savage Brands, a corporate design and communications shop. That building backs up to 4200 Montrose, where Hansen Partners has put a lot of its collection of abstract metal sculptures on view. There is this spindly, multi-colored item that graces the parking lot. 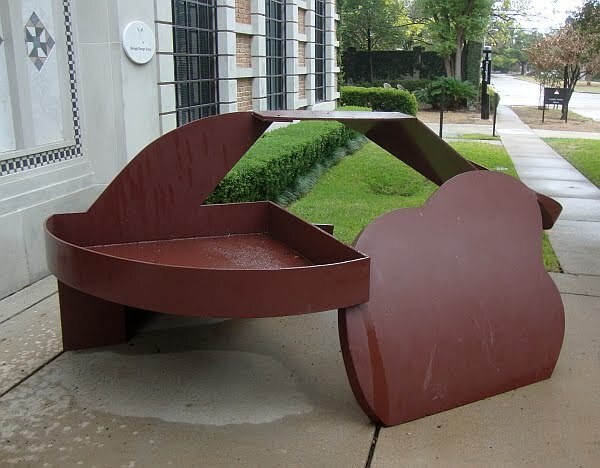 And there's this piece by George Smith. I happen to know that this is a George Smith partly because it looks like one, but mostly because it used to be located in front of Lanier Middle School over on Westheimer, and one day I saw George Smith putting a new coat of paint on it. And I knew it was George Smith painting it because he had been one of my professors at Rice. This might remind you a bit of the Tony Smith sculptures behind the Dan Flavin installation at Richmond Hall. George Smith studied with Tony Smith way back when. There is a glass lobby to this building (I believe in the past there has been a bank there). Inside the lobby, there are several more pieces of abstract artwork. Hansen Partners seems to have a serious investment in this kind of decoration. Across the street is 4119 Montrose, a relatively new building designed by Phillip Ewald Architecture. 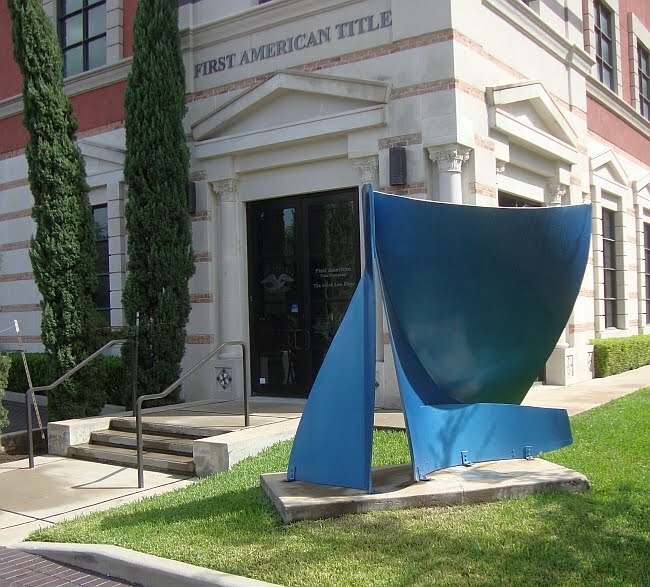 This blue, sail-like sculpture sits to the right of the modest entrance. 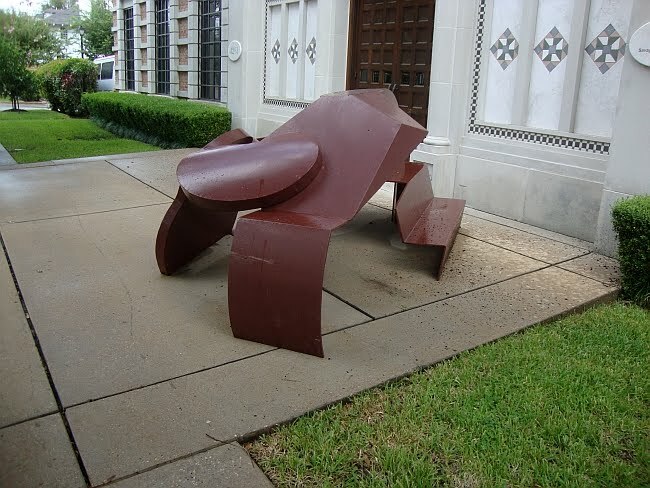 I'd say the entrance is so modest, I kind of needs a marker like this sculpture to draw attention to it. So Hansen Partners has decorated their suite of properties with sculptures. What does this say about them? None of the sculptures are huge, although they are generally larger than human sized. So they aren't trying to overwhelm you with corporate might. I think they are generally signalling tastefulness. The sheer quantity of them signals wealth--it says, this isn't just a sculpture, this is a collection. It also signals "artsiness" which has a particular value. It helps make the buildings attractive to firms like Savage Brands. It also signals to the neighborhood that "we belong"--this is, after all, the neighborhood of the Menil, of several commercial art galleries, etc. So to me, this is pretty successful corporate plop art. 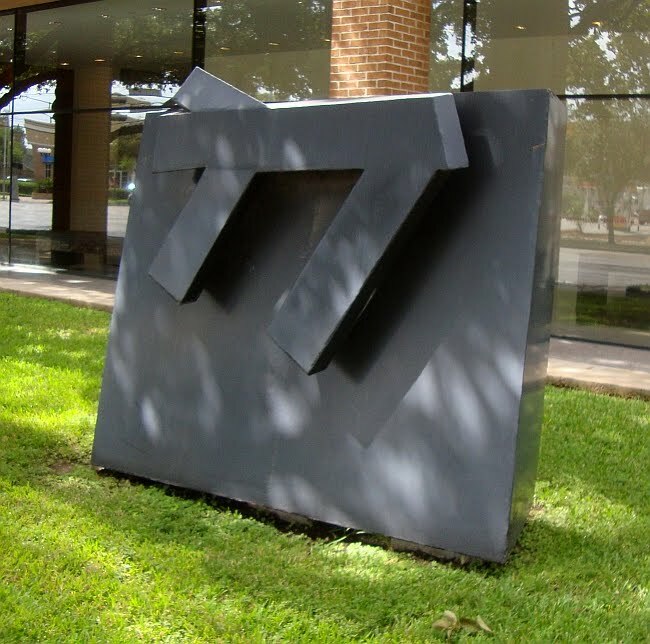 Hey, that's piece by George used to sit in front of Lanier just off Westheimer, didn't it? Hal--Your article-skimming skills have deteriorated since you were at Rice! Either this or a nice day-glo fiberglass Jimenez.